ElVisti Review 2019: Is ElVisti a Good Hosting? ElVisti has been in the web hosting business since 1993. The vendor is based in Ukraine. It offers a complete line of web hosting solutions including: domain name registration services, shared web hosting, and colocation services. ElVisti is a Ukrainian web hosting provider established in 1993. The company offers an array of internet services including: registration of IP addresses and domain names, shared web hosting, and colocation services. The vendor’s data centers are located in Kiev, Ukraine. Its website is available in Ukrainian and Russian. ElVisti offers web hosting solutions on its multi-user servers that operate on the FreeBSD operating system. The web hosting solutions come with disk space of between 10MB and 10GB. 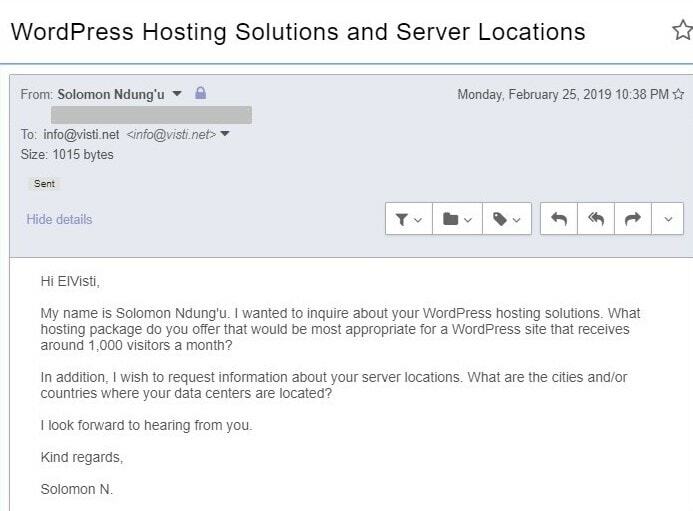 The vendor doesn’t appear to offer various packages for users to choose from based on their hosting needs; it seems like you have to contact them for further information. ElVisti also offers customized colocation and server building services that include the development and maintenance of servers for small office gateways, dynamic multi-providers routers, corporate mail servers, and web servers installed in data centers. After designing and creating a server network, this vendor offers users a fully fledged server support solution. This solution includes monitoring software status, diagnostics of problems with hardware, upgrading current software versions, and log analysis. ElVisti provides its customers access to its data backup system where website data backups are performed at the disk subsystem level protected by RAID1 to RAID10 hardware. The ElVisti website is poorly designed and unappealing, and has little information about its hosting solutions. ElVisti web hosting solutions are expensive, especially if you consider that they come with very few, awfully limited features. The vendor provides a flexible monthly billing cycle. The hosting prices are listed in U.S. dollars. While this vendor’s hosting solutions are expensive, it offers notable discounts of up to 50% for customers who need large volumes of disk space as well as those who commit to longer contracts. ElVisti does not offer an uptime network guarantee and has no refund policy. Customers can get in touch with the ElVisti support team via telephone or email. The vendor has not availed a live chat or ticketing system and my email to this vendor received no reply. ElVisti also has no knowledge base on its website. An analysis of the ElVisti website leaves little doubt that this vendor has not made a lot of effort to deliver excellent hosting solutions to businesses in Ukraine and Russia. With very limited information about the hosting solutions that it offers, it is hard for potential customers to feel that they know what they should about this vendor and what it offers to make a good decision. Wondering how ElVisti stacks up against other Web Hosting companies? Enter any other Web Hosting company and we will give you a side-by-side comparison.